I love s’mores. 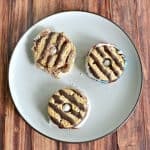 When I was younger I was in Girl Scouts and whenever we went to camp S’mores was one of those things you had to make around the campfire. Of course we made S’mores whenever we went camping as a family too. I’ve made s’mores using a campfire, using the burner of a gas stove, and even in a fireplace before. 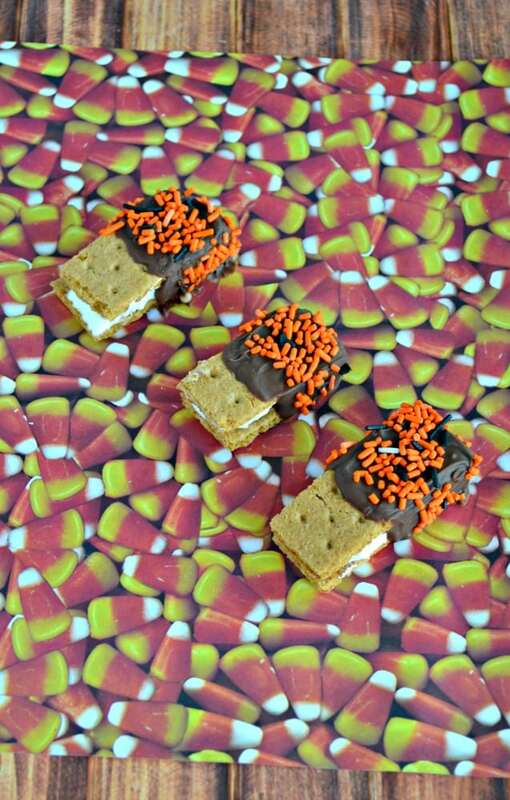 That’s why I’m sharing an awesome recipe for Chocolate Covered S’mores today for #Choctoberfest2016 . As an adult I don’t really go camping anymore but that doesn’t mean I can’t have s’mores at home! 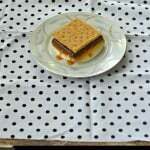 I have a recipe for delicious Salted Caramel s’mores made in the oven that are really good. It’s pretty easy to make them as long as you have some sort of heat source. 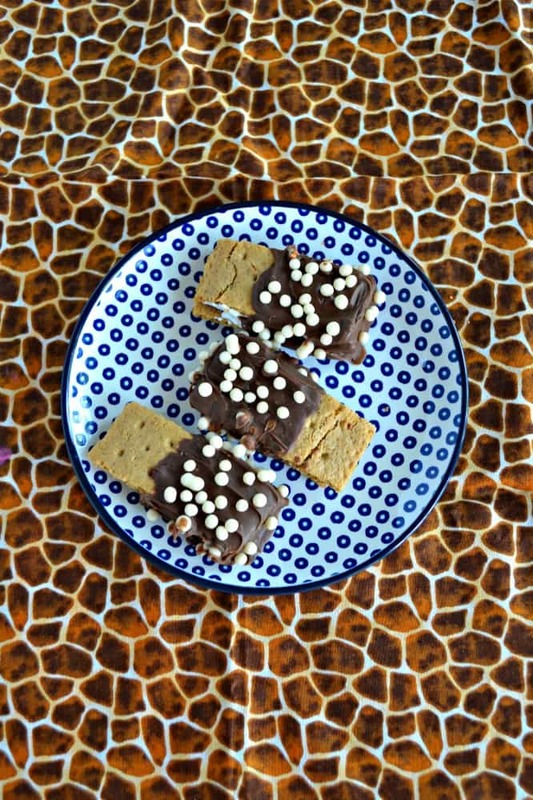 These chocolate covered s’mores take a little more work but they are still easy to make. In fact, the only heating required is a minute or two in the oven to melt the chocolate. 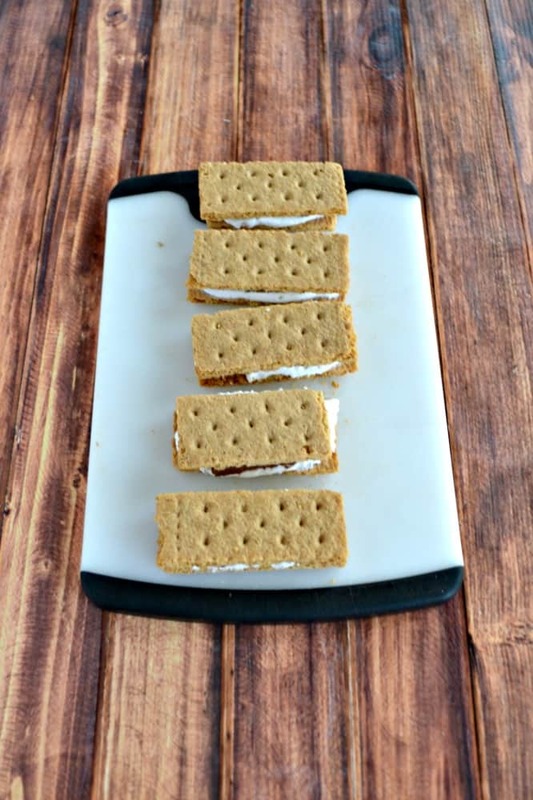 After you’ve put these s’mores together they need to cool so that they can harden. Unfortunately it was so humid in my house I couldn’t get them to harden so I put then in the freezer for a few minutes. Once they came out I was able to dip them in chocolate. I dipped them about halfway in and then quickly put sprinkles or chocolate crisp balls on top of them. I did half of my s’mores in orange and black sprinkles because I thought they would be fun for Halloween. I did the other ones in chocolate crisp balls because they looked really fun on top of them. 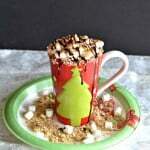 You could dip the s’mores in any color chocolate and pour on any sprinkles or toppings you’d like. I love that the end that isn’t dipped is perfect for holding the s’mores and eating them. They are so delicious. It’s like a normal s’mores but with extra chocolate and the fun sprinkles. I bet kids would love putting on their own sprinkles! 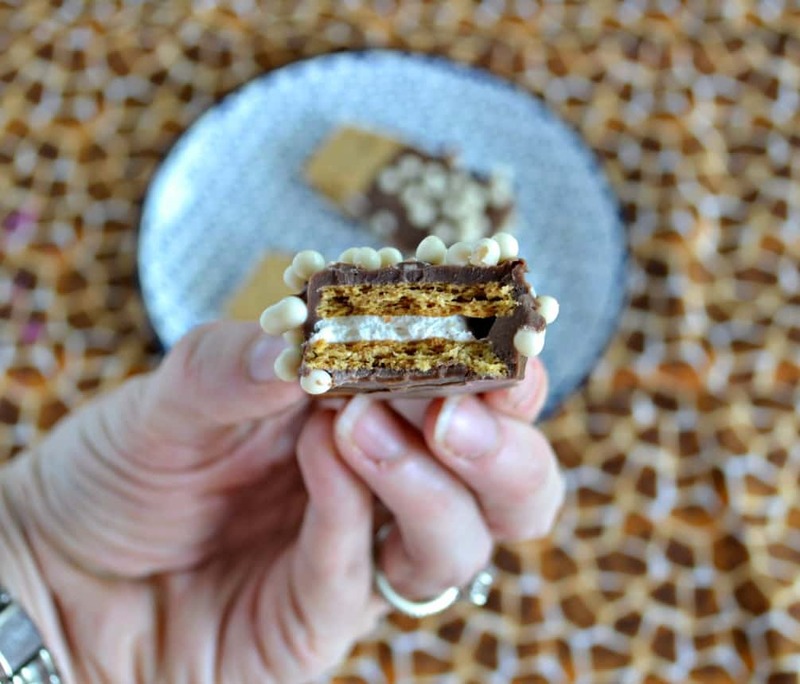 Make s'mores at home without any fire and with added chocolate! 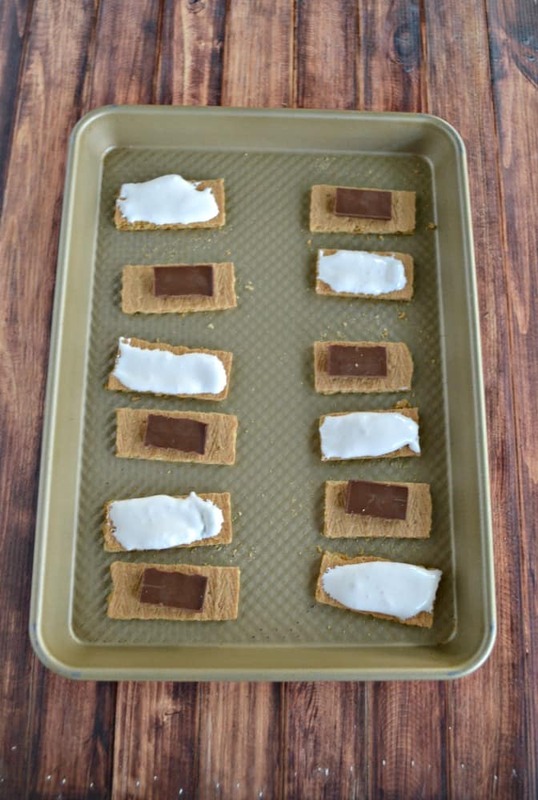 Place the graham crackers on a cookie sheet. Place the 12 chocolate pieces on half of the graham crackers. 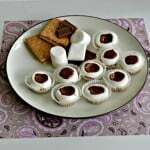 Spread 1 tablespoon of marshmallow cream on each of the remaining 12 graham crackers. Heat in the oven for 2-3 minutes or until the chocolate is melted. 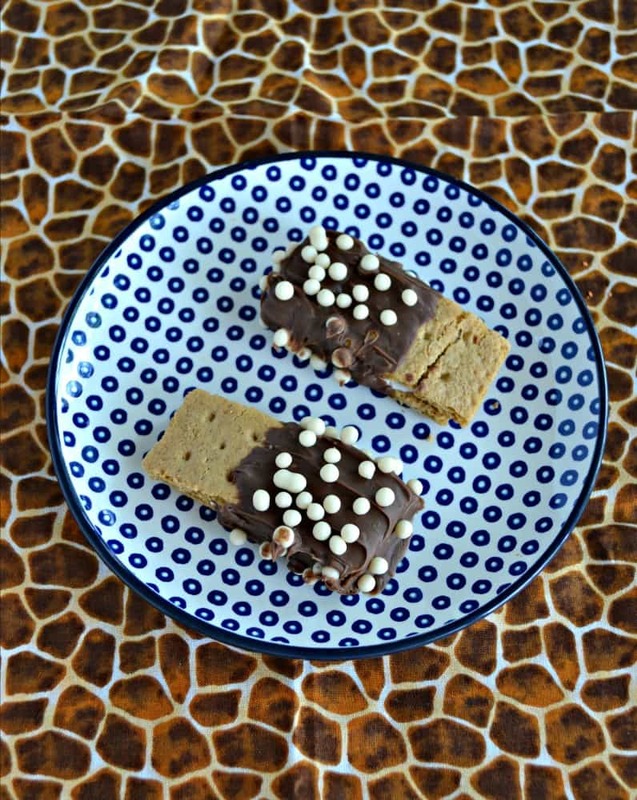 Immediately push together a graham cracker with chocolate on it and a graham cracker with marshmallow. Stick them together and set back on the cookie sheet. Allow the s'mores to cool and harden. Meanwhile, place the chocolate melts in a small bowl and heat in 30 second increments in the microwave, stirring after each heating, until melted. Dip one end of the s'mores bar into the chocolate then lay it on waxed paper or parchment. Quickly sprinkle with sprinkles or other topping. Allow to harden and enjoy! S’mores can NEVER have too much chocolate! Now you’ve done it — chocolate inside & out! Love that I don’t need a campfire to make these!